The Secret Science Club: Tuesday, December 11, 8PM @ the Bell House, The Secret Science Club presents invertebrate zoologist and leech expert Mark Siddall, FREE! The Secret Science Club presents invertebrate zoologist and leech expert Mark Siddall, FREE! Spineless wonders! Bloodsucking beasts! Creepy, crawly coolness! --Why does the newly discovered Tyrant Leech King, a.k.a. T. rex, favor dining on mucus membranes, such as the inside of the human nose? --What are legitimate (as well as highly suspect) health uses for European medicinal leeches (Hirudo medicinalis) and how did these creatures evolve their anticoagulant abilities? --How might chemicals in leech saliva be used to develop new drugs to prevent heart attacks and fight cancer? --Is there a symbiotic relationship between leeches and the microbes that live inside them? How have advances in molecular and digital imaging transformed the study of microfauna? 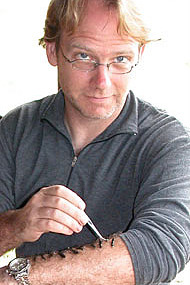 Mark Siddall is curator of Annelida and Protozoa at the American Museum of Natural History, professor of invertebrate zoology at the Richard Gilder Graduate School, and principal investigator at the Sackler Institute for Comparative Genomics. The author of dozens of scientific papers, Dr. Siddall has been a featured scientist in the New York Times, Discover, and on PBS NOVA ScienceNOW. 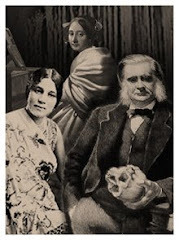 This sanguine edition of the Secret Science Club meets Tuesday, December 11, 8 pm @ the Bell House, 149 7th St. (between 2nd and 3rd avenues) in Gowanus, Brooklyn. Subway: F or G to 4th Ave.
Photo courtesy of NOVA ScienceNOW.